It has been a while since I saw this one but I am always in awe of it because of the idea of someone giving up modern conveniences to live in the wilderness. Starring Harrison Ford and the late River Phoenix this tale follows the journey of a family who gives up the world that they know to create one in an unknown wilderness to try and give back to the world by living off of the land. Supporting performances by Helen Mirren and the Reverend guy (sorry I can't think of his name right off) help to make this unusual story stand out. I love the cinematography of this flick. I think it would be interesting to live like this for a while, but please I would have to have my movies to survive. One of Harrison's deeper performances in my opinion. He really let everything go for that role and it worked in his favor. Do you guys have any thoughts on this flick? A good movie, but a bit long, I liked it and then the end dragged. A must see though. 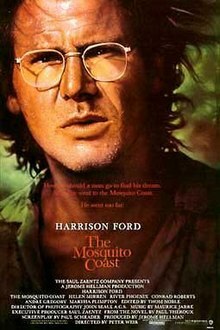 Watched The Mosquito Coast (1986) and it was a pretty good drama from Peter Weir. And like Devo said, the ending is a bit of a letdown.